This technical manual applies only to outdoor P10 (32 * 16) swept four full-color unit board. ● Use bright LEDs and high quality plastic parts. 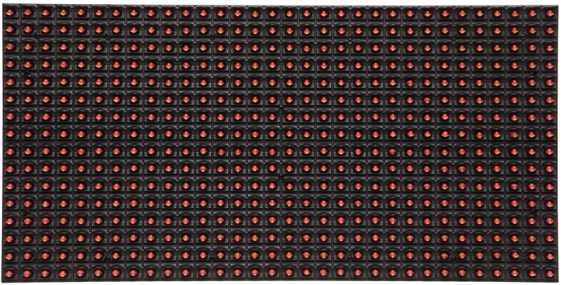 ● pixel pitch of 10mm, a total of 32 * 16 pixels, each pixel composed by yellow lights. > 60 frames / sec. 9.3 The main display and the shell should maintain good grounding resistance less than 3 ohms lightning and achieve the purpose of preventing accidental electric shock accident. .
9.4 Installation environment should avoid strong electromagnetic equipment9.5 Connected to the power supply line (5V) the number of individual power module outsourcing port serial port should not exceed the load capacity of a single power line, typically a single load 2.5mm² power cord 11A (ie, generally no more than 4 cell plate), không thể kết thúc của mô đun vì libra voltage, resulting in decrease in brightness. 9.7 After body panel, be sure to use 220V AC line and the part of 5V DC line short-circuit, after confirmation before electricity. 9.8 Power, if found shorted, trip, firing line, smoke and other anomalies appear, the test can not be repeated power, should be promptly troubleshoot. 9.10 LED display switching sequence: On-screen use - first turn on your computer, open the display power. Khi tắt màn hình - Turn off screen, thì tắt tắt máy. Incredibly switching sequence, may damage the LED light chip board. 9.12 Watch meeting the requirements under the premise, we recommend the software's "brightness adjustment" function, the body will reduce the screen brightness to 60% -90% of its maximum brightness, the lower the brightness, the light fades more slowly, the longer its life . 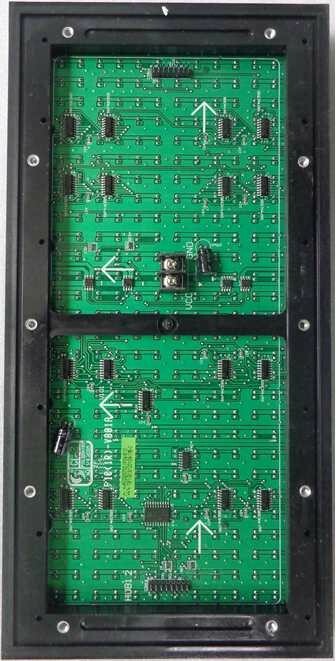 led display can not be used in severe wet conditions, especially in the resurgence of the weather, such as improper use and storage of the display will affect the normal operation of the switching power supply, thus affecting the normal operation of the on-chip LED module , hoặc giải phóng tới chip (như như hiện thời IC and 4953, etc); so recommended in the dry season, at least a week to open the display one day; within 60% ~ 80% RH relative humidity range recommended daily minimum to open display times more than two hours to remove moisture on display, the best time is between 7:00 am to 10:00 or 18:00 to 10:00 am The such as humidity above 80% RH or resurgence of the weather, it is recommended more than a day to play video 8H and night to shut the windows and windows to prevent the resurgence of serious noise. 74HC245 roles: LED module or unit board input signal to the buffer and amplify the signal effect. 74HC595, 16126 such as constant voltage constant current IC: LED driver chip, LED module or unit board column to eight or eight lights work drive IC control. 4953 roles: Line drive tube, power tube. Chuyển đổi hành động, khi LED được bật trên hay tắt chế độ. Nhóm hoặc đơn vị mặt bên dưới 16 or 32 lamps. 74HC04 effect: 6 inverters. The decoder outputs the signal to control the inverter, the protective effect. 74HC138 roles: eight binary translation decimal decoder decodes the signal line. CLK clock signal: in case, khi đồng thời gian tín hiệu là abnormal, màn hình sẽ hiển thị màn hình. Latch signal STB: In any case, khi latch signal là abnormal, màn hình sẽ hiển thị thông tin. EN enable signal: màn hình màn hình chỉ ra màn hình điều khiển cũng được chọn để màn hình màn hình. Điều chỉnh Duty cycle như dài như nó có thể điều khiển các thay đổi trong brightness. Whenever the enable signal is abnormal, the entire screen will not appear bright, bright or dark tailing phenomenon. ABCD line signal: 4 scan signal can be as long as AB, 1/8 scanning needs ABC signal 1/16 scanning need ABCD signal, control signal when the line is abnormal, the display will appear misplaced, highlight or image overlay, etc. phenomenon.